If you already follow me on the Social Media, you may already know my fascination in doing weddings at Hacienda Siesta Alegre. It’s just the ultimate venue of its kind for your hacienda wedding in Puerto Rico. It’s just so charming!!! So, when Nadiya told me she would have an intimate destination wedding there, I was already excited! Nadiya and I met a couple of days before her wedding at the hotel, where we discussed the photography wedding details she wanted to do on the day-of; a charming, small event, with just a small amount of relatives and loved ones. And that’s exactly what they got! I started the day off on a rustic suite on Hacienda Siesta Alegre, where Nadiya was getting her hair and makeup done. One of the things I enjoyed the most about this part was getting to know people of so many different cultural backgrounds, and working along with them. We did a couple of bridal portraits, and pictures with family & friends, after which I went up to the antique library room of Hacienda Siesta Alegre, where I met Stefan for the first time, as he was getting ready for the wedding. Minutes later, a charter bus arrived with all the guests, as we got ready to start the ceremony. Everyone was just in awe with the beauty and charm of the hacienda, they greeted Stefan and were quick to give them props for the venue selection. After a couple of groom pictures, we headed to the ceremony site, which has a beautiful panoramic view of the mountains that characterize our rainforest, El Yunque. As Nadiya walked down the aisle, I stood by Stefan’s side as he exclaimed how beautiful she looked. I melted by the way he treated and looked at her during the whole ceremony. They looked deeply in love! Stefan’s father officiated the ceremony, so it was a really emotive and special moment of the day. They declared their vows, exchanged rings, and finally, after the kiss, they took a moment to commemorate their native countries, who are currently at war. They took a minute to wish them peace, as balloons rose to the sky. The reception decor was a very simple and beautiful one in a rustic romantic style. After their group and newlywed pictures, we went on to the reception site, where they recreated their traditional first dance, interrupted by a super-fun flash mob, where all of us discovered what a pair of good dancers they are. Afterwards, two very emotive toasts were given by close family members, which gave start to the great dinner made by Chef Piñero, a highly acclaimed chef in the Island. As I’m writing this, my cheeks hurt from smiling remembering what a great day it was, and I feel very fortunate to have been part of it. I wish you both a great life together, and a never-ending honeymoon. Hope you’ve enjoyed this set as much as I did! 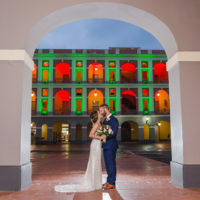 Camille Fontánez is a Puerto Rico Destination Wedding Photographer. She is available for Weddings and Love Stories in San Juan and island wide.